"I really used the philosophy that if you can stand the consequences, take the risk." For more information about his year's winners and the program, visit our 2017 Healthcare Hall of Fame. In her long career in nursing, Colleen Conway-Welch figured out sometimes it's good to bend the rules a bit. She first realized that early in her career, as she cared for a patient nearing death. Dogs, however, weren't allowed in the hospital. But that rule interfered with Conway-Welch's idea of how best to care for her patient, so she found a way around it. She brought the dog up to the fire exit in a small basket, allowing a reunion between the dying woman and the dog she wanted to tell goodbye. That would be a theme for Conway-Welch throughout her career—advocating for nurses to do more, to learn more, to push boundaries to make sure patients are cared for. 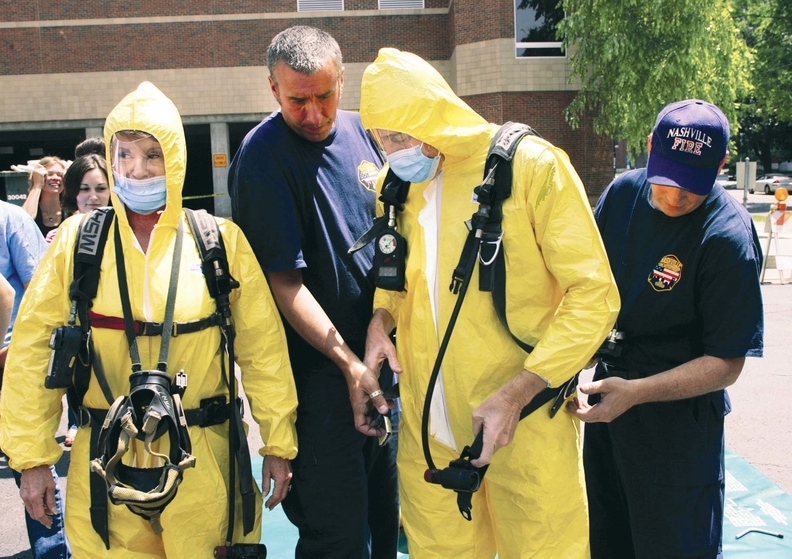 Conway-Welch, left, participates in a biohazard drill on the Vanderbilt campus in 2005. She has long been a strong advocate for increased disaster preparedness training at healthcare facilities. And that sense of getting things done served Conway-Welch as she went from nursing in the field to a long, successful tenure as dean of the Vanderbilt University School of Nursing. Conway-Welch rescued a financially struggling school and used common sense, charm, and some maneuvering around the rules to make a long-lasting difference in the nursing profession, in the care of people in Vanderbilt's home city of Nashville and in nursing education. Conway-Welch, 72, says, technically, she wasn't so much a rule-breaker as someone who found ways around rules when needed. “Let's say, I occasionally bent the rules,” she said. For her accomplishments in nursing and nursing education Conway-Welch is being inducted into the Health Care Hall of Fame. 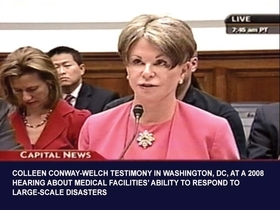 Conway-Welch testifies at a 2008 hearing in Washington, D.C., on healthcare organizations' preparedness for large-scale disasters. She's been a frequent speaker at the state and national levels. In the 1980s, with a stigma still surrounding the new AIDS crisis, Nashville had a higher than typical number of cases. Eventually, Vanderbilt would recruit a top AIDS specialist, Dr. Stephen Raffanti, and collaborated with him on a treatment center. But at the time, pushing the university to embrace research and treatment of the disease was controversial, given how much was unknown about HIV and AIDS. Conway-Welch, who served on an AIDS task force created by President Ronald Reagan, looked the same way at being out in front on issues and problems that might need some rule-bending. “I really used the philosophy that if you can stand the consequences, take the risk,” she said. And that idea is one of the main things she wants new nurses to learn. Conway-Welch was involved in many construction and renovation projects during her tenure. 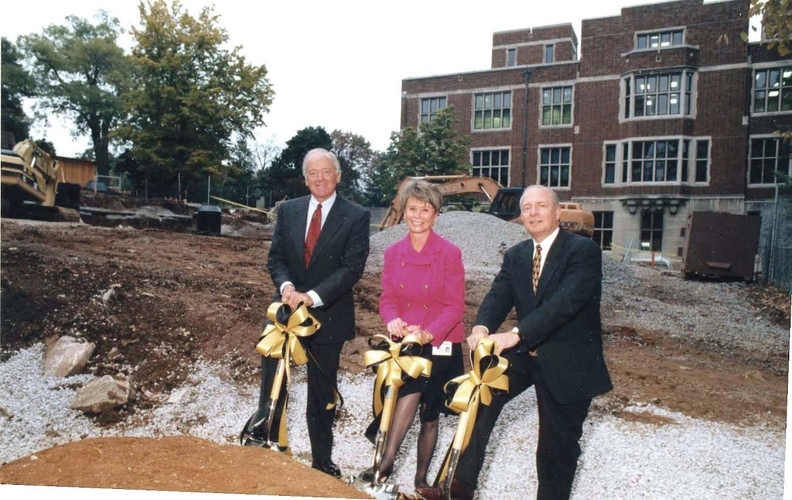 Here she participates in groundbreaking for the Patricia Champion First Hall at Vanderbilt's School of Nursing in 2007. She also believes in a nursing workforce that is more broadly educated—something she pushed at Vanderbilt, where she created an accelerated program to bring in new nurses who were educated first in other fields, because, she believed, they brought something extra to their profession. Conway-Welch also used a little bit of charm, and moved comfortably in the circles of donors and politicians that a dean of a major nursing school must court. 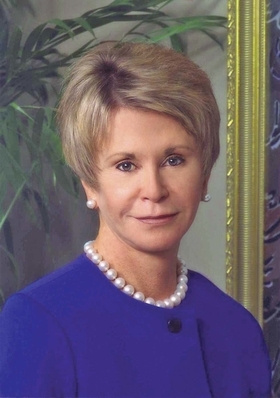 One of the first major donors she approached after being named dean, Nashville businessman Ted Welch, was so charmed that he ended up marrying her. He was also a major Republican fundraiser, and the two were friendly with big-time players in Tennessee and national politics. Conway-Welch was good at that too. “She could work a room,” Pilon noted. But despite her husband's Republican ties, Conway-Welch worked both sides of the aisle. She had a good relationship with two-term Democratic Tennessee Gov. Ned McWherter. In retirement, Conway-Welch is checking off a bucket list that includes a recent trip to Israel and an upcoming trek to Chile. And she's still bending the rules for what everybody says 70-somethings should be doing in retirement.